So, I’m not quite that bad, but some days, it feels like I’m close. 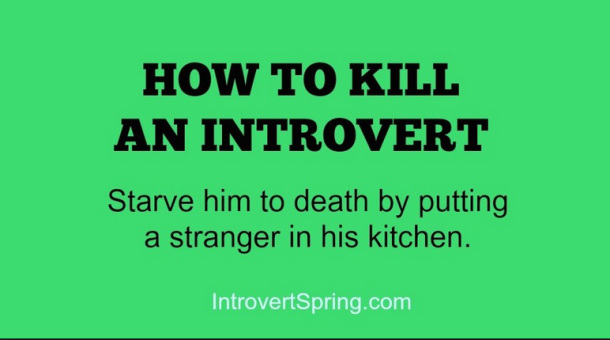 Here’s something else that will come close to killing a introvert: have an extroverted child. I love my children dearly, but my eldest is an extrovert. A full-on extrovert. She loves people. She doesn’t just enjoy being around them, she needs to be around them. Not long ago, she had a jam-packed Saturday. Get up, go to gymnastics. Come home, have a snack, go to her first birthday party. Come home, have lunch, get a quick nap, then go to her second birthday party. This was a long affair, complete with swimming and supper. My husband and I were exhausted just thinking about it, and we were prepared all day for when she said she didn’t want to go or wanted to come home early. We just kinda looked at each other and shook our heads. It’s winter here, and for us introverts, it’s really an excuse to do what we love. We were looking forward to a typical introvert weekend at home. I had a new book on my Kindle, DH had some video gaming he wanted to do, and the weather was promising to be awful. As I’m driving the kids home from “school,” my extrovert asks me what we’re going to do that weekend. I tell her. She starts crying. Real tears. She is so distraught all Friday night and Saturday morning I eventually called in the grandma cavalry. We’re fortunate, and both of our moms live less than twenty minutes away. We were doubly fortunate, and they were both able to make a stop at our house that weekend. It helped the extrovert a lot, and we all made it through the weekend with a minimum of tears, mine included. While traumatic all around, it taught me how important it is to schedule for my extrovert. While I hate being around crowds, and I don’t like my schedule jam-packed. She does. She not only likes it, but a part of her needs it. I’m still learning how to deal with it. How about you? Anyone close to you that is an introvert when you’re an extrovert, or an extrovert when you’re an introvert? How did you handle it? Are you still close to them? I am an introvert. Myers-Briggs pegged near the end of the scale. My wife is an extrovert who enjoys being with people. We worked out the compromise 43 years ago that continues to work. When she wants to be with people, I let her. I go a reasonable number of occasions to be just considered on the quiet side vice anti-social. It works for us. Sometimes I love to hunker down with a book and draw the curtains (or never even open them) other times I’m out partying, with the more people the merrier. 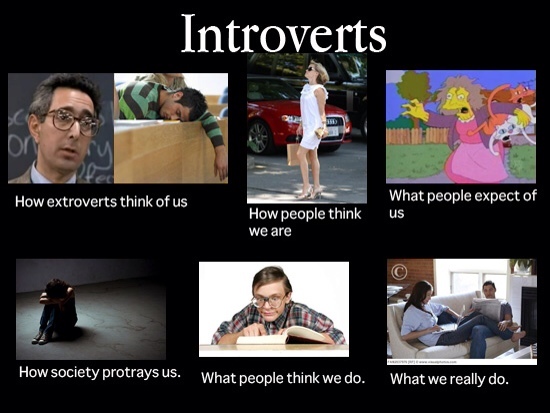 now I’m just confused as to whether I’m introvert or extrovert! Hee hee, yes, that’ll be it.